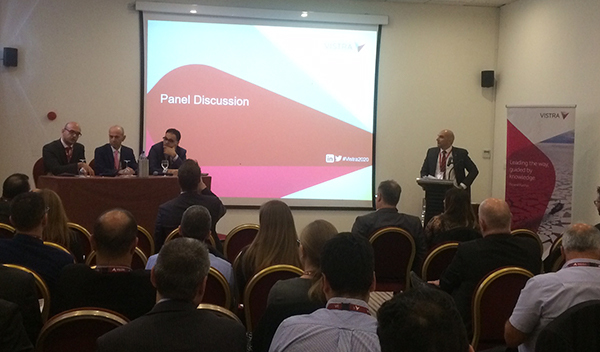 Kyriacos Xenophontos, a partner in our firm and head of our affiliated trust company, was one of the three expert panel members invited to give their views on Cyprus’s services, legal and regulatory sector at the Vistra 2020 seminar held in Limassol on 4 April. Vistra is an international leader in the field of trust, fiduciary, fund and corporate services, with more than 3,500 professionals in 44 countries. The seminar, which Demetris Roti also attended, was one of a series held in locations including Hong Kong, Singapore, Shanghai, Luxembourg, Dubai and London to present the well-established “Vistra 2020” annual market report. Bearing the title “the disruption advantage: opportunity in a changing world” the wide-ranging and in-depth discussion covered the contemporary business, regulatory, political and economic environment in which professionals in the services sector operate and the challenges facing them, with particular reference to demand scenarios in the industry over the next 5 years, the tendency to look onshore and shift from offshore due to regulatory, economic and geopolitical climate changes, threat of technological disruption as well as the increased regulatory and compliance burden resulting from initiatives such as FATCA, the OECD’s BEPS project and the Common Reporting Standard. One of the main issues was technology and its potential impact on the way that business is conducted and the challenges of cyber security and privacy in the face of pressure for public registries of beneficial ownership. The consensus was that although uncertainty, unpredictability and instability are widespread, there are still opportunities for promising investments based on proper tax planning and strategic structuring.